The Walton Company, from its inception, has been committed to producing products that are inherently earth friendly. ProtectoMat®; and GrafixMat®; are examples of this commitment. Our products are manufactured with only the finest quality recycled cork and hardboard in our signature dual-layer construction. These one-of-a-kind cork mats combine utilitarian and aesthetic qualities in a product that is manufactured from environmentally efficient materials. 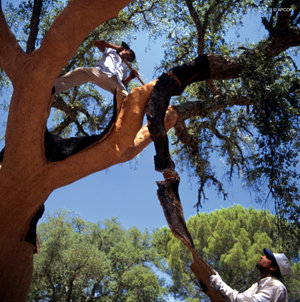 Cork is the bark of a variety of oak tree from which the outer layer has been cyclically harvested for hundreds of years, without harm to the ancient trees. The ProtectoMat and GrafixMat surface material is made of cork derived from trimmings produced in wine cork manufacturing. Similarly, the superior hardboard used as the base is manufactured from by-products of the building industry. These two recycled materials are permanently laminated with a waterproof bond, providing the unparalleled strength and durability found only in the original ProtectoMat and GrafixMat cork mat lines.